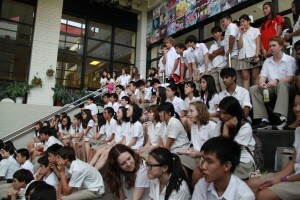 At CDNIS, all students will participate in the IB MYP Programme in Grades 7 – 10 and the IB Diploma (DP) in Grades 11 and 12. In addition, all students will participate in the Ontario Secondary School Diploma Programme (OSSD) in Grades 9 – 12. A key feature of the MYP, DP and OSSD is the emphasis on criterion-based assessment of performance. This means that students are not graded “on a curve” or based on other students’ performance; learning is measured in relation to established, published standards that apply equally to each student. In the MYP Programme, Ontario Ministry of Education achievement charts and MYP criteria are aligned to form level descriptors, which are used for evaluation purposes. These are structured according to the four Ministry categories: knowledge, inquiry/thinking, communication, application, and the MYP and (subject specific) assessment criteria. Throughout the two-year IB Diploma Programme, student progress is assessed by teachers through classroom and group work, assignments, labs or artistic performances. IB internal assessments (which count for 20 – 50% of the final grade, depending on the subject) will be graded by the subject teacher using the IB rubric. Highly qualified IB examiners moderate samples of these assessment tasks. The IB grade for the internal assessment will be converted to a percentage for the OSSD grade using the conversion scale approved by IBSO (IB Schools of Ontario). All IB written examinations (50 – 80% of the final grade, depending on the subject) are taken in May and are graded externally by IB examiners. These examiners are experts in their topics who report to a Chief Examiner. Final grades are awarded in early July. Candidates for the diploma normally take all examinations in a single session in May at the end of the two-year period of preparation. In the OSSD (Grades 9 – 12), credits are assigned on an annual basis and accumulated over the period of four years. 70% of the final OSSD grade given in a course will be based on evaluations conducted throughout the course (i.e. projects, labs, assignments, tests) and will be determined by the teacher. In Grades 9 to 11, 30% of the final OSSD grade will be based on a final evaluation, usually in the form of an examination, but can include a performance, essay and / or other method of evaluation suitable to the course content. For all Grade 12 students taking Year 2 DP courses, 30% of the final OSSD grade will be based on the final IB grade assigned in early July. For these courses, the student’s final OSSD mark becomes a weighted average – 70% from course work (assessed by the teacher) and 30% from the final IB grade in the subject (assessed externally). Students who write IB exams in Grade 12 will not be required to write OSSD exams in these same subject areas in June.